Overall inequality: Series 1: since 2006, data on Gini coefficient of disposable equivalised household income are taken from EU-SILC, Eurostat website. Eurostat points out that there is a break in the series in 2013; Series 2: Gini coefficient of disposable equivalised household income taken from LIS website, starting in 1982 and ending in 2004; Series 3: Gini coefficient of after tax incomes averaged over 2 years of tax units from Abele and Lüthi, 1977, Tableau 10) based on the estimates including non-taxpayers by Noth (1975, Tabelle 19), where the year identified is second of 2 year period. Top income shares: Share of top 1 per cent in total gross income from WID.world (tax units, excluding capital gains), based on work of Dell, Piketty and Saez (2007). Updated by Foellmi and Martínez (2016). Tax units refers to individuals (adults) minus one half of married men and women; from 1996, the definition of adults changes from aged 20 and above to aged 18 and above, creating a break. Poverty measures: Percentage of individuals living in households with equivalised (EU scale) disposable income less than 60 per cent of the median from EU-SILC (People at risk of poverty after social transfers table), Eurostat website (accessed 13 April 2017). Dispersion of earnings: Earnings at top decile as percentage of median earnings from OECD iLibrary, Employment and Labour Market Statistics, Gross earnings decile ratios (accessed 22 February 2017); linked at 1996 to Atkinson (2008, Appendix R, Table R.2). Wealth inequality: Share of top 1 per cent of households in total personal net wealth from Roine and Waldenström (2015) updated to 2008, downloaded from Waldenström’s webpage. Abele, H A and Lüthi, A P, 1977, “La repartition personelle des revenus en Suisse entre 1941 et 1972” in G Gaudard, H Kleinewerfers and J Pasquier, editors, La politique économique de la Suisse, Editions Universitaires, Fribourg. Atkinson, A B, 2008, The changing distribution of earnings in OECD countries, Oxford University Press, Oxford. 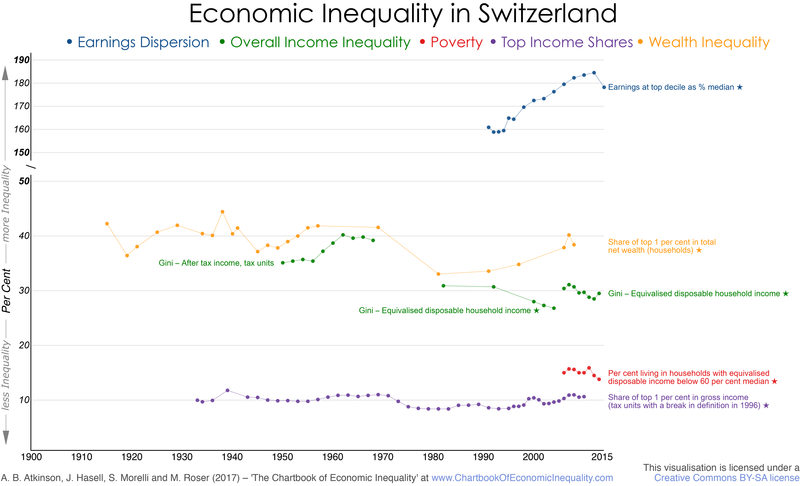 Dell, F, Piketty, T and Saez, E, 2007, “Income and wealth concentration in Switzerland over the twentieth century” in A B Atkinson and T Piketty, editors, Top incomes over the twentieth century, Oxford University Press, Oxford. Ecoplan, 2004, Verteilung des Wohlstands in der Schweiz, Berne. Foellmi, R and Martínez, I, 2016, Volatile Top Income Shares in Switzerland? Reassessing the Evolution between 1981 and 2008. Forthcoming on The Review of Economics and Statistics. Levy, R, Joye, D, Guye, O and Kaufmann, V, 1997, Tous égaux?, Editions Seismo, Zurich. Noth, A, 1975, Die personelle Einkommensverteilung in der Schweiz 1949 bis 1968, Dissertation, Universität Freiburg, Freiburg. Ohlsson, H, Roine, J and Waldenström, D, 2008, “Long-run changes in the concentration of wealth: An overview of recent findings”, in J B Davies, editor, Personal wealth from a global perspective, Oxford University Press, Oxford. Roine, J and and Waldenström, D, 2015, “Long run trends in the distribution of income and wealth” in A B Atkinson and F Bourguignon, editors, Handbook of Income Distribution, volume 2, Elsevier, Amsterdam. The data for this website and publication are published as Atkinson, Hasell, Morelli, and Roser (2017), “The Chartbook of Economic Inequality”. Information on the supporting institutions and on permissions for using this work can be found in the About page.